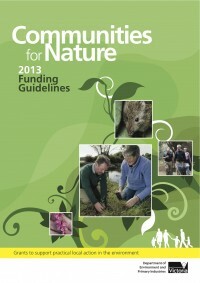 Communities for Nature Grants – 2013 Small and Large Grants Funding Opportunity is open until 13 September 2013. The Victorian Government is committed to supporting the Victorian community to contribute to practical on-ground solutions for local environmental issues. Community groups and volunteers doing works primarily focused on the environment. Communities with relevant and timely information to assess priorities at the local level to determine the best returns for on-ground works. Communities for Nature grants are available to eligible organisations including local community groups and organisations, including schools. The program has up to $4,000,000 to invest for the 2013 for small grants of up to $10,000; and for large project grants of $10,001 to $150,000. 1. Download the program guidelines and FAQs. If you need assistance, please call the Grants Information Line on 1300 366 356 (during business hours). 2. It is strongly recommended that you contact the Grants Information Line on 1300 366 356 to be put in touch with someone in your region who can provide technical input into your application. 3. Seek approval from the relevant land manager/owner to undertake works and consult with your local Shire/Council regarding any permits for works you may need. 5. Submit your grant application by midnight Friday 13th September 2013.